The founder of the Hizb Al Nahda (Renaissance Party), Rashid Gannoushi, was arrested, tortured, exiled and made to live for many years outside Tunisia. He returned to his native land after 20 years of absence on January 30, 2011, in the aftermath of the popular unrest that ousted Zine Al Abidine Bin Ali from the presidency. Because of the many uncertainties surrounding Tunisia and the anticipated Constituent Assembly elections, now scheduled for October 23, the very future of democracy in the country was in jeopardy. Gannoushi's views and putative roles were critical and worthy of a careful investigation if for no other reason than to affirm how an Islamist supported democratisation. Long before the 2010 demonstrations, which were precipitated by poor living conditions and high unemployment for the vast majority of Tunisians, young men and women who were educated overseas and who envisaged a society where political freedoms were the norm, mobilised against the Bourguiba and Bin Ali governments. Gannoushi, who hailed from Al Hama, in the Qabis province of southern Tunisia, lived for several years in Cairo, Damascus and Paris, which emancipated his outlook. Upon his return to his native land, the young Gannoushi founded the Harakat Al Ittijah Al Islami (Islamic Tendency Movement, better known by its French acronym MTI — Mouvement de Tendances Islamiques) in April 1981, an organisation that was quickly banned for harbouring Islamist affinities. 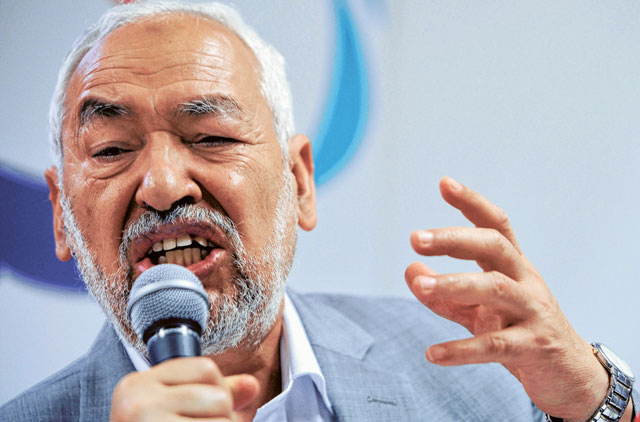 There was no doubt that Gannoushi was influenced by the Muslim Brotherhood in Egypt and Syria, even if his chief objection at the time was towards various secular ideological principles incorporated by Tunis. Whether he became a Salafi — the way the word is understood today — was an entirely different proposition, though the young man was persuaded that social reforms based on the true principles of Islam were the salvation that his nation sorely demanded. In one of his more poignant declarations, Gannoushi said: "I remember we used to feel like strangers in our own country. After having been educated as Muslims and Arabs, we found our own country totally moulded in the French cultural identity." This he rejected. What he and his supporters wanted was to promote Islamic principles, highlight and explain differences between these and Western ideologies, and live exemplary lives whenever possible. After 1988, Tunis tolerated the MTI and similar movements that, for the most part, focused on moral concerns. Earlier, the Bourguiba regime did not perceive Islamists as a threat to the state, whose nemesis were the so-called "leftists", and which could be nicely balanced by the MTI and others. Ironically, at one point, even Bourguiba presented himself as favouring Islamic principles. In the event, and in the aftermath of the 1979 Soviet War for Afghanistan, which mobilised Islamist organisations against the USSR and atheism, the MTI took on a far greater political role. Coupled with the 1979 Iranian revolution, the 1982 Israeli invasion of Lebanon and the rise of various movements across the Muslim world, Gannoushi's MTI led to an open confrontation with the regime. The sting was so painful that interior minister Driss Guiga stated in 1981: "We are six million Tunisian Muslims. We are all the Islamic Tendency. No one can accept that certain individuals claim the monopoly of Islam and pretend to act under its name or its sacred values to hide their political goals." By May 1981, Gannoushi had entered into a political alliance with several other groups and called on the government to recognise the MTI as a political party. Neither Bourguiba nor his interior minister, Bin Ali, were interested and promptly arrested 60 leading members for forming an illegal organisation. At a time when the Tunisian economy was topsy-turvy, MTI officials spoke of prosperity, whereas the state was reduced to micro-management. Calamities followed one after the other. In 1985, a portion of the income flow from Tunisians working in Libya stopped after the maverick Colonel Muammar Gaddafi expelled 40,000 Tunisian workers — ostensibly the result of a downturn in the Libyan economy — because of political considerations, as the maverick colonel practised the "expulsion" tool as a weapon against what he concluded were uncooperative governments. Simultaneously, the Tunisian economy suffered another blow as tourists stayed away after the October 1, 1985, Israeli raid on the Palestine Liberation Organisation (PLO) headquarters near the capital city. These developments, coupled with high unemployment, improved MTI's popularity as the movement positioned itself as an alternative to the state eager to look after the downtrodden. Tunis banned the group, as a major crackdown became the norm, and which eventually led to an MTI plot that, allegedly, planned to overthrow the Tunisian government and replace it with a religious one. In August 1987, 99 MTI members were charged with "forming an illegal organisation; plotting subversive actions with Iran; and attempting to overthrow the government". Five were sentenced to death while another 69 received verdicts ranging from two years to life imprisonment. After his coup d'état, Bin Ali reaffirmed Islam as the country's religion and adopted more conciliatory attitudes towards "moderate Islamists". His appeasement granted a general amnesty for imprisoned MTI members, including Gannoushi; the creation of a consultative body empowered to address religious concerns, the High Islamic Council — which, interestingly, welcomed an MTI leader Shaikh Abdul Fateh Mourou to its rosters; the inclusion of the MTI in the National Pact that grouped leading parties to draft fresh participatory rules; allowing Islamists to run for office in the April 2, 1989, elections, albeit as independents; the legalisation of an Islamist student organisation; and the authorisation for Al Fajr, an Islamist newspaper, to publish freely. Remarkably, Gannoushi adhered to the 1988 law that prohibited the formation of political parties on the basis of religion, region or language and, consequently, changed its name to Harakat Al Nahda or the Renaissance Movement before it formally became a hizb (party). Unabashedly, Al Nahda envisaged a government that would apply Sharia while proceeding through the democratic process. Indeed, in the April 1989 elections, its "independent" candidates won 15 per cent of the total vote, with up to 40 per cent in major cities including Tunis. Regrettably, not a single parliamentarian was allowed to enter parliament, which led to further arrests and expulsions. What followed was a series of violent clashes and, while Harakat Al Nahda presented itself as a non-violent political party, Tunis ensured it was implicated in clashes with security forces. Whether all these collisions originated in the MTI or whether they were "encouraged" by the Bin Ali regime needed further elucidation. Suffice it to say that Harakat Al Nahda became "illegal", with its leaders either jailed or exiled. In the post-9/11 environment, president Bin Ali opted for a proactive antiterrorist policy, which gained Western, especially American, backing. Whether Gannoushi, who lived in London between 1989 and 2011, would once again play a major role in his country's politics remained an unknown proposition. Suffice it to say that writing and delivering countless lectures moulded his thinking. Like most Arabs, he supported various Palestinian movements, including Hamas. Unlike most Islamists, however, he developed an appreciation for multiparty democracy in the country that gave the world the Magna Carta. Long before the uprisings in the Arab world, which started when Mohammad Bouazizi immolated himself on December 17, 2010, in Tunisia, Gannoushi spoke of serious socio-economic reforms. His writings, including the Al Bayan Al Ta'sisi li-Harakat Al Ittijah Al Islami (The Founding Communiqué of the Islamic Tendency Movement), represented what was a progressive strain in Islamic reformism. In additional writings, he stressed the need for innovation against social injustice and while this was not a fresh idea in the larger scheme of evolving Arab ideologies, he emphasised the importance of culture. In his view a correct Islamist movement took into account the needs of citizens — not just believers — as he distanced himself from "obscure theories", such as the ones espoused by the famous Egyptian Islamist Sayyid Qutb. Again, perhaps because of his observations in Britain, Gannoushi concluded that there was value in the very idea of workers' rights, unions and, the most emancipated view of them all, in women's education. Of course, Islam recognised the value of work and granted women full rights from its inception, though few Islamists could reconcile themselves with such outcomes. Gannoushi started out opposing the Bourguiba and Bin Ali regimes but entertained pragmatic political views. While he preferred to rely on Sharia, he nevertheless wished to distance himself from the cherry-picking that, regrettably, became fashionable. He maintained, for example, that Islam recognised special roles for women with full rights and privileges, including education. Unlike the Taliban in Afghanistan, he insisted that women receive all the benefits that a community could offer, including access to learning. In several of his writings, Gannoushi cited oppressive cultural codes in certain countries — especially Tunisia, Algeria and Morocco — as the leading reason why women turned to Western culture away from Islam. Genuine reforms, he argued, needed to address women's rights. In numerous lectures, he frequently called on men to respect women and welcome them to add value to the nation. An equally powerful argument in Gannoushi's philosophy was his conclusion that pluralistic Muslim societies ought to stress the cultural wealth brought into the realm by non-Muslim citizens. Towards that end, he repeatedly pointed out that Arab citizens who happened to be non-Muslim ought not be barred from positions in the government, which was a position that was opposed by conservative Islamists. Except for Lebanon, where a political parity existed between Muslims and Christians, no other Arab country tolerated such an outcome according to their respective constitutions, though exceptions existed at certain times for a few well-placed individuals in Egypt, Jordan, Morocco, Iraq and Bahrain. For Gannoushi, nevertheless, the key feature of this perspective was to amalgamate citizenship (responsibility) with privileges (rights). On January 22, 2011, in an interview with Al Jazeera TV, Gannoushi confirmed that he opposed an Islamic Caliphate the way it existed in history. Rather, and unlike several other parties that emerged in the new Tunisia, the former Islamist voiced his support for democracy. That, he posited, was the true meaning of Islam. Rashid Gannoushi was born in 1941 outside Al Hama, in the Qabis province of southern Tunisia, into a relatively prosperous family. After secondary education and a Baccalaureate (high school + 1) in 1962, he enrolled at the University of Zaytunah, destined for a promising career in the sciences. To further enhance his training, he entered the school of agriculture at Cairo University in 1964, which was not the ideal learning forum at the time. When Egypt expelled Tunisians in the mid-1960s, ostensibly because of a dispute between Jamal Abdul Nasser and Habib Bourguiba (the latter was deemed too neutral in the Arab-Israeli conflict and pro-French in other instances), Gannoushi left for Syria. Rather than continue in agriculture, however, the young man opted to study Philosophy at the University of Damascus, from where he graduated in 1968. It was in Damascus that Gannoushi first joined the Socialist Party, which intrigued him for its egalitarian penchants. From Syria, Gannoushi moved to France, where he attended the Sorbonne dabbling in various subjects — including religious studies — before returning to Tunisia. His new goal was to reform Tunisian society through a political organisation that promoted Islamic principles. In April 1981, Gannoushi founded the Harakat Al Ittijah Al Islami (Islamic Tendency Movement), which promoted anti-violence and called for a "reconstruction of economic life on a more equitable basis, the end of single-party politics and the acceptance of political pluralism and democracy". Notwithstanding democratic aspirations, Gannoushi and his followers were arrested in July 1981, tortured, tried and sentenced to 11 years in prison in Bizerte. Released in 1984, he returned to prison in 1987 with a life sentence, but was again released in 1988 a few months after the November 1987 bloodless coup d'état against Bourguiba. Gannoushi moved to Britain where he was granted political asylum, became a prolific author and continued to criticise the Tunisian government as corrupt. He returned to Tunis after the regime of president Zine Al Abidine Bin Ali fell in early 2011. Dr Joseph A. Kéchichian is an author, most recently of Faysal: Saudi Arabia's King for All Seasons (2008). Published on the third Friday of each month, this article is part of a series on Arab leaders who greatly influenced political affairs in the Middle East.